"Brother, who are you? What are you doing? I'm with the news, dude"
A van that appeared to have no driver made headlines when it was spotted in Arlington, Virginia, last week. But when News4's Adam Tuss saw the van on Monday and looked inside, he saw that it did have a driver: a man dressed in a costume made to look like just a car seat. From the road, the unmarked gray van eerily looks like it's moving without a driver. The entire front seat looks empty. But when Tuss looked inside, he saw a man wearing a beige and black costume that covered his entire torso. His arms poked out of the bottom of the costume to steer. His face was completely covered, like that of a sports mascot who can see out, but no one can see in. "I looked out and I said, 'Oh my God, there's a guy in a seat costume," Tuss said. "How's that possible? Your brain can't get around it for a second." Tuss went to the Clarendon neighborhood of Arlington on Monday to talk with ARLnow.com founder Scott Brodbeck about the vehicle he saw in Clarendon and Courthouse on Thursday night. As Tuss left the ARLnow.com offices, he saw the 2017 Ford Transit Connect himself. He and a News4 photographer followed the vehicle in Clarendon and Ballston for about 20 minutes. Tuss went to knock on the window. At first, he thought he saw an empty seat. Then, when he looked below the wheel, he saw a man's hands and legs. "Brother, who are you? What are you doing? I'm with the news, dude," Tuss said. "Dude, can you pull over and we can talk for a second?" But the driver didn't say a word. 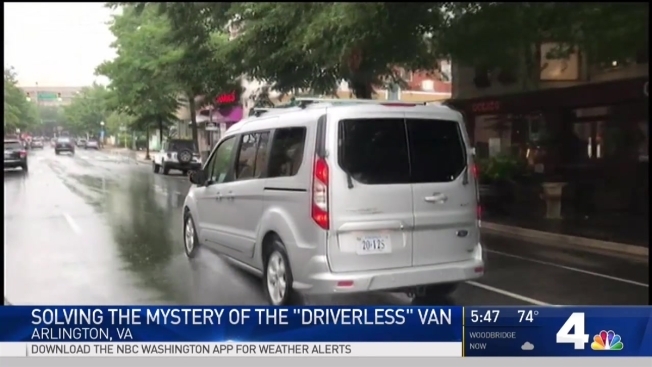 After multiple inquiries by News4, the Virginia Tech Transportation Institute said Monday afternoon that the van and van driver are part of a study they are conducting on driverless cars. The worker was wearing the uniform he was supposed to wear. "The driver's seating area is configured to make the driver less visible within the vehicle, while still allowing him or her the ability to safely monitor and respond to surroundings," a statement from the institute says. Virginia Tech declined to make the half car seat, half man -- as Tuss put it -- available for an interview. Arlington County officials were involved in the planning for the study, a Virginia Tech spokeswoman said. Arlington was selected because "it is representative of the urban areas for which automated vehicles are currently being considered," she said. Go here to learn more about the study. The Virginia Department of Transportation was not aware of the vehicle, a representative said. The Arlington Police Department was "shocked" by news of the van, one representative said. Several "invisible driver" prank videos can be found on YouTube. The drivers are entirely hidden by costumes that look just like car seats. CORRECTION (Aug. 8, 2017, 9:30 a.m.): An earlier version of this story said the driver ran a red light, in apparent attempt to evade News4. But a spokeswoman for the Virginia Tech Transportation Institute says a thorough review of the in-vehicle camera showed the driver passed through a yellow light.